overall: 182.9 x 182.9 x 182.9 cm (72 x 72 x 72 in.) gross weight: 500 lb. Die was one of Tony Smith's first steel sculptures and the inspiration for much of his later work. He had made a six-inch cardboard model in black in 1962, but he did not have Die fabricated until 1968. To have it made, Smith telephoned the Industrial Welding Company in Newark, New Jersey, whose sign, "You specify it; we fabricate it," had caught his eye on trips to and from New York. The artist's specifications for the sculpture were as follows: "a six-foot cube of quarter-inch hot-rolled steel with diagonal internal bracing." The dimensions were determined, according to Smith, by the proportions of the human body. He explained that a larger scale would have endowed Die with the stature of a "monument," while a smaller one would have reduced it to a mere "object." It is this simple yet profound observation about scale that placed Die at the center of key artistic debates. Weighing approximately 500 pounds and resting on the museum floor, the sculpture invites us to walk around it and experience it sequentially, one or two sides at a time. The sculpture's deceptively simple title invites multiple associations: it alludes to die casting, to one of a pair of dice, and ultimately, to death. As Smith remarked, "Six feet has a suggestion of being cooked. Six foot box. Six foot under." Rationality, evoked by Die's purely geometric configuration, is countered by the sculpture's brooding presence. Meaning becomes relative rather than absolute, something generated through the interplay of word and object. Weaving together strains of architecture, industrial manufacture, and the found object, Smith radically transformed the way sculpture could look, how it could be made, and how it could be understood. The form, materials, and impersonal surfaces of the sculpture relate to Smith’s architectural background and to minimalist art of the mid-1960s. However, the artist also embraced the heroic and humanistic attitudes associated with abstract expressionist art of the 1950s. Smith was a pivotal figure who bridged two generations, and Die is now recognized as an icon of post-war American art. There are four examples of Die, but only two were produced during the artist’s lifetime: no. 1/3 was manufactured in 1962 and belongs to the Whitney Museum of Art, New York. The present example, no. 2/3, was fabricated in 1968 and kept in the artist’s backyard in South Orange, New Jersey, until his death in 1980. The two posthumous examples belong, respectively, to a private collector in Philadelphia and to the Museum of Modern Art, New York. The artist [1912-1980], South Orange, New Jersey; his estate; Paula Cooper, New York; purchased 27 May 2003 by NGA. 200 Years of American Sculpture, Whitney Museum of American Art, New York, 1976, no. 257, fig. 347. Changing Sculpture Exhibition, Paula Cooper Gallery, New York, 1985-1986. Sculpture: Andre, Grosvenor, Judd, Lewitt, Shapiro, Smith, Winsor, Paula Cooper Gallery, New York, 1985. Tony Smith. Selected Sculptures: 1961-1973, Part I, Paula Cooper Gallery, New York, 1985. Tony Smith. Skulpturen und Zeichnungen. 1961-1969, Westfalisches Landesmuseum, Munster; Stadtisches Museum Abteiberg, Monchengladbach, 1988, no. 1, repro. Abstraction in the Twentieth Century: Total Risk, Freedom, Discipline, Solomon R. Guggenheim Museum, New York, 1996, fig. 167. Tony Smith: Architect, Painter, Sculptor, The Museum of Modern Art, New York, 1998, unnumbered catalogue, repro. Forum, The Carnegie Museum of Art, Pittsburgh, 1999. Jo Baer, Dan Flavin, Sol LeWitt, Tony Smith, Paula Cooper Gallery, New York, 2002. Vogel, Carol. 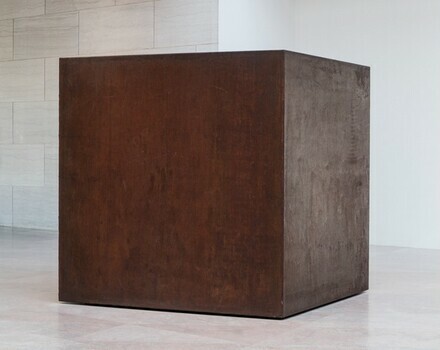 "Inside Art: A Tony Smith Finds a Home." New York Times (May 2, 2003): repro.